For as long as I can remember (and even longer as evidenced through old photos!) I have sat around a table the first night of Pesach with a large group of family. From the small dining room at my grandparents’ house to the little bit larger dining room in my parents’ home, to the even larger family room at our home in Lexington and finally to the combined dining/family room referred to by our contractor as the “Seder” room in Cambridge. The room has always been full – sometimes so full that it felt like the walls must be made of elastic. This year we decided to host our large family Seder on the sixth night of Passover. The reasons were varied, but centered around two important truths 1) the extended family all really wanted to be together for Passover and 2) Monday night April 14th was not a night that everyone would be able to be together. I wrestled (like a good Jew) with the idea of “evolving” the holiday (like a good Progressive Jew) to meet the needs of the “next generation”. Ultimately we decided to give it a test/a pilot (a word I am using often in my work). The troops cheered and we made our plan. I knew we would be giving up “something”, but wasn’t quite sure what that would be. Lo and behold, about 10 days ago, with a jolt, I realized that Michael and I did not have plans or a place to be for the first Seder. We’ve never received an invitation for the first night because everyone and anyone who knows us knows that we hold a Seder, that Passover is our favorite holiday and that Seder is our favorite night of the year. We knew that if we waited for an invitation we would be alone on Seder night. Could we treat the first night of Passover as a regular night if we were having Seders on nights 2 and 6? Could we have dinner on our own and eat Matza and discuss freedom? After thinking about it for less than 60 seconds we knew that the answer was no. We knew that “that night was different than any other night”. Fortunately, we have a large circle of friends to whom Judaism is meaningful and we knew that, if we asked, we would be welcome at dozens of tables. And yet, asking is not easy. Or at least, asking for oneself is not easy. Many of us are great at fundraising and at getting people involved for other “needy” causes, but don’t think of ourselves as the needy ones. We are not comfortable in that role. We want to give and not receive. However, we knew we had to express our need for an invitation. So we did. Of course, we were welcomed with open hearts (to one of those rooms with full tables and elastic seeming walls) and we are looking forward to sharing the Passover experience with another family, whose “in” jokes and rituals we will not know but will be familiar anyway. Through this process, I have learned an important lesson about what it means to be on the other side of the table, to be the one wanting and needing an invitation. 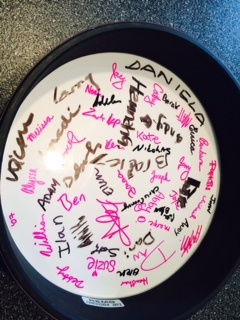 Tambourine signed by our Seder attendees over the years.